What airport would we fly into? You would fly in to Tucson International Airport if arriving via the United States. You are always welcome to fly in to Phoenix Sky Harbor, which offers many more flight options and choice, in addition to cheaper rates, and drive to Tucson or Douglas as well (there is also a Sky Harbor airport to Tucson shuttle service available that offers almost hourly departures from Phoenix to Tucson [arizonashuttle.com). While our third party shuttle cannot pick you up in Phoenix, they can drop you off two blocks from Sky Harbor as well. Guests have taken arizonashuttle.com to Tucson, for pick up to the ranch the next morning, and then, our third party shuttle from Douglas to Phoenix when departing the ranch. If flying via Mexico, you would make flight arrangements through Hermosillo, Sonora, followed by taking a 5 hour bus ride the next morning to Esqueda, where we would pick you up. Is there an incentive for us to drive to Douglas in our own car? Absolutely. If driving from Tucson or Phoenix in a car rental or your own vehicle, you are welcome to leave it at our family home in Douglas, where it would be parked in our driveway, in a very safe and secure neighborhood. Douglas is the town that borders our crossing area into Mexico. We offer a $40 credit, per guest, if your group has a car and drives down to Douglas, leaving your vehicle in our home for the duration of your stay with us. This $40 credit offer is good for weekend pick ups only, though you are more than welcome to drive your car to Douglas on a weekday as well, leaving your car at our family home. We would naturally return you to our home, and your car, at the conclusion of your stay. This incentive allows you the opportunity to, in most likelihood if visiting from out of state, rent a car in Tucson or Phoenix, and enjoy the freedom that comes with a rental, whether sightseeing, traveling at your own leisure and speed, having a flexible itinerary, as you travel down to Douglas. This incentive is great for groups wanting to explore Arizona, or for those staying in Arizona either before or after visiting us. It is great for those that want the freedom and flexibility of having a private vehicle while on holiday. 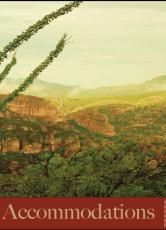 This incentive is also our way of making your stay in the Sonoran desert even better. We know a stay at the Rancho can stretch a budget, and we hope this $40 incentive per guest to drive to Douglas can make your stay with us even better. There are great car rental websites that offer outstanding rates for you to choose from. If interested in our Drive to Douglas incentive, please do not hesitate to inquire. Do you have a pick-up and drop-off policy? Yes. Our policy asks that arriving flights be made and reserved for a Tucson arrival at or before 9:00 a.m., and that departure flights be made for departures after 3:00 pm. This policy is strictly followed and we can make NO EXCEPTIONS. This is due to the nearly four hour drive from Tucson to the ranch's front gate, the 45 minutes from the front gate to your lodging, plus any waits or delays at the border crossing. We must also coordinate with our third-party shuttle company's pick-up and drop-off times, as they help transfer guests to and from Tucson. We also want to get you to the ranch in time to see the sights and, perhaps, in time for an adventure. If you cannot secure flights that fall within our policy times, we ask that you stay at a Tucson hotel prior to pick up the next day or after drop off, for a flight the next day. This would also allow you to break up the long trip into two manageable trips. We highly recommend spending the night in Tucson prior to your pick-up date. If you chose to fly on the same day as your pick-up there is a high risk that your flight may get delayed, thereby causing you to miss your pick-up time. If flights are delayed, and you cannot meet our pick-up time, we will pick you up the next day, in the morning. We do not pick-up after our policy's stated time of 9:00-9:35 am. NO EXCEPTIONS are made. We do not offer refunds for any nights missed due to flight delays. Our pick-up and drop-off policies are strictly adhered to. If you risk taking a flight on the day of pick-up, we highly recommend securing travel insurance. Tucson's airport hotel section is modern, safe, comfortable and quite inexpensive, offering a diverse set of options. All hotels located there also offer free shuttle service to and from the airport, and they are located within one minute or two of the airport. Please ask us for information on Tucson hotels as we are quite familiar with many of them. How many hours is the ranch from Tucson and what is the best way to get there? The ranch is a three and a half, four hour drive to our front gate entrance from Tucson. From Douglas we are 55 miles south, into northeast Sonora, Mexico. We offer round trip transportation from Tucson (airport area or central hotel) or Douglas to the ranch and back to Tucson (airport area or central hotel) or Douglas. This service is included in our rates and is a service we provide our guests, if a weekend pick-up. Weekday pick-up incurs a $40 per guest charge. Taking advantage of our shuttle is the best way to get to the ranch, thereby avoiding fees for car permits, getting Mexican insurance, and traversing our rocky, bumpy dirt roads. Leave the driving to us, the sightseeing to you. With the ranch's front gate a three and a half, four hour drive from Tucson, why should I visit? Simply put, because it is one of the most scenic drives you will ever encounter. You will see southeast Arizona, passing through Tombstone, and you will enter Mexico, passing several villages along the way, including Fronteras, where Geronimo, famous Apache chief, surrendered for the last time, and which he raided several times. It is also the town where Pancho Villa, famous Mexican Revolution hero, had one of his final battles. Once on the dirt road, your first adventure truly begins. An amazing eco jeep tour, this journey will showcase a land, and a scenery, that many say is National-Park like. You will escape civilization and enter a land that time forgot, traversing a diverse and pristine land that is incomparable. We see the ride to the ranch as part of your adventure, an opportunity to slow down, take in the sights and scenery, and enjoy what will surely be the most off-road ride of your life. If you want adventure, this is a great way to get started. This road is truly a magnificent off-road jeep ecotour. We also think it is, in this world of ever encroaching civilization, the only way to visit and see untamed, unspoiled, secluded and people-free land. Nowadays, if you want to see the most scenic, spectacular and preserved land, for a chance to experience Dark Skies, a serenity and quietness that is wonderful, scenery that is inspiring and a wilderness that is pristine, you need to travel far and wide. How else, if not to take roads less traveled in lands rarely seen, is one to get as far away from modern life as possible and discover a great adventure, and have a great vacation? Part of the lure, and thrill of visiting a guest ranch is escaping the city, and modern life, with its noise, buzz and lights. A guest ranch near a city cannot offer what we, at the ranch, can offer: a ranch far removed from civilization, surrounded by wilderness, in an original, unique setting. With the ranch being located in Mexico, will we have trouble communicating with hosts, guides, guests, etc? Not at all. Even though we are in Mexico, knowing Spanish is not essential nor needed while at the ranch. We are fully bilingual and bi-cultural, and speak English very well, some would say like natives. Indeed, English is the language of choice that is spoken at the ranch [except our cowboys]. Some of our team members are American and European, and all of our guests are fluent in English too. Jill, our co-director, is from Minnesota and Manuel, our other co-director, has spent his years studying and working in the US. Where in the world do your guests usually come from? Our guests visit us mainly from the US (50%), Canada (20%), Europe (20%), Australia and New Zealand (10%). Does it cost to leave the US, enter Mexico, and/or entering back into the US? Not one penny. We take care of the driving to the ranch, and there is never a fee or tax upon entering Mexico with us. The same applies with entering back to the US. Are passports needed in order to visit the ranch? Guests visiting us do need a valid passport to get back in to the US. You do not need one to get into Mexico. However, there is also an alternate form of valid ID accepted at all border crossings called the US Passport Card [for US citizens]. If you do not want to get a passport and only want to visit us, with no future plans to travel abroad, the passport card might be the best option. US citizens can also cross back home with a valid license. Do children need to have a passport as well? Children under the age of sixteen DO NOT need to obtain or present a passport at the port of entry. Children sixteen or over DO need a passport. All that is needed is a valid certificate of birth or other form of state issued identification. (Please make sure to check with American customs for any updated policy). Is the ranch suitable for children? Absolutely. Children of all ages are welcomed at the ranch to join in with their parents in activities. We have hosted children as young as 9 months. Most children join in with their parents in our many adventures. Of course, adventures can be and are tailored to children in a group, making sure they are suitable to the various physical and mental abilities and limitations of our young guests. Pre-teens and teenagers, especially, flourish at the ranch. The personal development seen over the course of their stay is very apparent, as they escape the wired world and enter the natural world. Our collection of activities offers fun, entertaining, relaxing, thrilling and challenging adventures that our pre-teen and teen guests absorb fully. Many of them thrive while at the ranch, evolving with each day of their stay. Our ranch is a great opportunity for children to discover mental and physical abilities, and learn a little about themselves in the process. The adventures at the ranch takes them away from their element for a few days, opening their eyes to the outdoors, to being active in nature, and to the beauty of the natural world. With so many kids today wired to TV, video games, cell phones, music, the Internet and more, the ranch offers the opportunity to escape this wired world for a few days. After decompressing and disengaging, our kid guests discover a world beyond the wired, to a world of the wild. I am not a horseback riding enthusiast. Don’t guest ranches cater specifically to riders, with non-riders being secondary? While the vast majority of guest ranches do, in fact, cater to horseback riding, offering non-riders limited engagement, Rancho Los Baños is not any ordinary guest ranch. We are an adventure guest ranch, meaning that our adventures are designed both for riders and non-riders alike. Our ranch caters to adventurers of all kinds, offering activities designed for thrills, challenges, entertainment and active engagement. While our riding is world-class, and a big part of our program, our other adventures, such as our famous box-canyon hiking, are just as important to us and our guests. We take all our adventures just as seriously. Secondary is not in our vocabulary. In fact, about 35 percent of guests visiting us do not get on a horse while at the ranch. Because we are known for all our adventures, and not simply horseback riding, many guests spend their days at the ranch hiking, fishing, kayaking, jeeping, bouldering, wildlife spotting, visiting 2,000 year-old dwellings, mountain biking, stargazing, relaxing and enjoying our pristine 30,000 acre wilderness preserve. Horseback riding, while thrilling and fun, is but one of our many adventures designed for the enjoyment of all our guests. Ours is a guest ranch both for riders and non-riders alike; ours is a ranch for adventure travelers, nature enthusiasts and those seeking an active, engaging and relaxing vacation, whether your stay brings you for riding, hiking or other activities. Like all ranches, we love horses and riding; however, we also love adventures of all kinds, too, and this fact is reflected in our guests and the adventures offered at the ranch. Our aim is changing the concept of what a guest ranch is. We are a 21st century ranch, with pristine,secluded wilderness as our stage. With a round-trip shuttle service provided by the ranch, are there specific days you pickup/drop-off in Tucson? We ask that if possible, pick-up dates, and the start of your vacation with us, start on either a Saturday or Sunday. If this is not a possibility and want to start your stay during the week, which is quite common and expected, we can arrange to pick you up for a fee of $40 per guest.We are a small guest ranch, with limited team members, meaning that we cannot afford to stretch ourselves too thin by offering daily pick ups and drop offs to Tucson. If possible, we want to group all incoming guests together for a great ride down to the ranch. Regarding drop-offs, we can arrange to drop you off in either Douglas or Tucson on any day of the week or weekend, for no charge. Please see the next question for more details on drop-offs. ** During holidays [Thanksgiving, Christmas, New Year's ] we do NOT offer shuttle service to and from the Rancho on Thanksgiving Day, 23-25 December and 1 January. Does pick-up and drop-off need to be a Saturday to Saturday, or Sunday to Sunday, etc..? Because we have multiple, different packages [covering different numbered night stays], we do not have a set time frame that we ask you to stay. We welcome guests all days of the week, with a full slate of adventures during your stay. There are no Sunday to Saturday-only demands, for example, like most dude ranches. The day you want your vacation to end is the day we drop you off in Tucson [central location or airport location], and the day you want to start your visit with us is the day we arrange for pick-up. What sort of deposit is needed and what is the time frame for payment? A 50% deposit of the total cost of your trip to the ranch would be needed to secure a reservation. Once we know what package you are interested in, and how you wish to pay, we will design a transparent payment plan. Please remember that all PayPal transactions will incur a 3-4% surcharge, though this charge may be avoided. If we cannot avoid the fee, the ranch offers to split the fee between you and us. The last half of the total cost would not be due until three weeks prior to your arrival. For a detailed explanation of both our reservation and refund policies, please consult the Rates/Accommodation page of our website, near the bottom of the page. Could you provide a more detailed description of your accommodations? Please visit the page devoted to Accommodations for more details. What kind of food and meals are served at the Ranch? Do you cater to vegetarians and vegans? The all-inclusive rates and packages offer three great gourmet, home-cooked meals a day, including fresh, delicious mesquite fire cooked cuisine [oven, stove and coals]. Our cuisine is a fusion of both American and Mexican dishes. Our Mexican food is both northern and southern Mexico based. Pasta, salads, pizza, steaks and rotisserie chicken help shape our menu. All meals are combined with tasty home-made pastries, pies, cookies and other such delights. A large selection of fresh fruit and vegetables is also served. All snacks and non-alcoholic beverages are also provided. Our water is pure, clean, fresh spring fed, a real guest favorite. It emanates straight from a nearby cliff rock wall. Our meals are a constant guest favorite, made with pride and lots of love, without cutting corners, full of quality and quantity. Tasty, plentiful and delicious, the meals, from breakfast to dinner, will not disappoint. Examples of these meals include Mexican style-pulled pork (Carnitas) with home-made beans, tortillas and rice, homemade tamales, quesadillas, guacamole, chicken fajitas, mesquite-grilled steaks and porkchops, huevos rancheros, chile con carne, roasted oven chicken, enchiladas, chilaquiles, sopes, enfrijoladas, homemade chili, pozole and much more. Rancho Los Baños does cater to vegetarians, gluten-free, vegans and religious/philosophical preferences. At meals, guests dine family style in either our main dining area or in the outdoor palapas, overlooking vistas that are scenic and spectacular. Together with other guests, you will enjoy your meal along with great company. When on certain adventures, you will carry lunches with you inside canyons or in open country, to be eaten in intimate, private and fantastic picnic settings. Guests are encouraged to bring their own alcohol, as well as favorite foods and snacks as well. Alcohol and snacks can be bought on our way to the ranch. One thing is for sure: Guests do not go hungry at the ranch! Could a group of three or more share one room? Depending on the casita chosen and room selected three, four and even five guests can most definitely share a room, again, depending on the casita. Our one bedroom casitas are large, can easily accommodate three or four guests (queen and twin beds), while our 2-3 bedroom casitas can easily fit 4-8 guests. We do offer 5%, 10% and 15% discounts for groups deciding to stay in triple, quadruple or quintuple occupancy, respectively, though discount only applies for stays in one bedroom casitas, and only to number of full paying guests. If necessary, are guests able to wash some clothes? We do not have washer/dryer at the ranch but you are more than welcome to wash by hand, which a good number of guests do. Our great weather and sun take care of drying clothes in a couple of hours. How do you handle any injuries (minor or major)? To begin, we try our absolute best to preempt any injury by being prepared, vigilant, preventive and cautious. We are constantly aware of our guests, and we have become quite good at "reading" our guest's energy level and how they are performing on their adventures. We are aware, however, that accidents happen and we are in unspoiled wilderness, so our guides and hosts have training in wilderness response and survival, as well as first-aid. We carry our outfitter first aid kit at all times, and we are constantly monitoring, assisting and instructing our guests so that no injury occurs. We also observe our guests and their physical capabilities and limitations. If a guest shows that he or she cannot handle any one of our many hikes, we go ahead and reschedule the hike or alter it. We know the land pretty well and we study our guests so that we are aware of how they might perform during their adventures. If a serious injury occurs, we know and follow established protocols so we can safely evacuate our guest to the nearest hospital. Fortunately, up to now, and I think thanks in large part to our preemptive measures, we have yet to experience a major injury. We go to great lengths to safeguard the health of our guests, and it shows. With minor injuries, which are inevitable to some degree, we treat on site and thereafter back at the lodge, if necessary. Is smoking allowed on your property? Yes, though only outdoors [never in your casita] and then in spots where it won't bother our other guests. We also ask that you do not smoke where there exists a possibility that dry grass or brush can light up with ashes and start a fire. We are also a 420/pot friendly guest ranch. Is there cell service or a phone that we could be reached in emergency? We do have cellular service, depending on your specific phone company and plan, thanks to our cell signal amplification booster. AT&T and Verizon are two carriers that work well at the Rancho. If you wish to call home, we give you access to our cell signal booster so you can make phone calls. We routinely call the US from the Rancho, to our home office, for updates, logistics and information. Friends and family that want to get a hold of you simply call our US phones as well, where they leave a message which is then relayed to us at the ranch when we check in. At times, we have had guests put their American phones under Mexican carrier coverage. Most US carriers give customers the option to sign up for Mexican service if you will be traveling in Mexico. Each company charges differently, but the service is available and you can pick up the signal from our booster located conveniently inside our dining area. Additionally, we have had guests rent satellite phones, with reception anywhere. Or access to email or Internet to keep in contact with home? We do have limited Internet access. This consists of WiFi for checking your email, social networks, and limited website surfing. The service is not suited, and is unable to manage uploading of photos, playing of video games, uploading or viewing videos, movies, online phone chatting, uploading or downloading photos or listening to online music. One of the great things about a stay at the ranch, though, is the opportunity to simply unplug from all of our gadgets, from the news, from work and the real world. No Internet oftentimes feels liberating after a few days at the ranch.If you need to keep wired, for email and facebook, for example, we can provide WiFi service. Should you require an Internet or phone connection, we highly recommend speaking with your wireless and phone service provider to see if a temporary Mexico Data and Phone Plan is available for you. Within certain hot spots around the ranch, and most definitely at our main dining area, a cell signal is feasible thanks to our cell signal booster, with good reception, thus making a data and phone plan work well for you. I read about keeping hydrated. Should we be concerned about drinking the water? Water is absolutely not an issue of any kind. Our haciendas have both spring fed water, piped directly from the cliff rock it comes out of, and pure, healthy, secure well water. Both are delicious and pure, having never caused any sort of problem to anyone. The water is as safe as any found at American or Canadian guest ranches. Additionally, for those not fully comfortable with our water, bottled water from the US is provided. The reason we emphasize maintaining yourself hydrated is because we are in the desert, and a lot of people not familiar with the desert are not fully aware how fast the human body is capable of dehydrating in the desert, whether in winter or summer, spring or fall. The desert produces very dry climates. Before you know it, the environment has drained you of moisture. This is why we ask that you remind yourself to drink plenty of fluid. What are the opportunities for swimming during a stay at the ranch? We have many options if you are interested in swimming. We have access to both Lake Angostura (20 miles long x 3 miles wide) and its river, the Bavispe River. Both offer very clean and refreshing water. You can kayak and fish on both the lake and the river and swim near shore. We also have a warm spring creek that we call the Hanging Gardens, which gushes water and has multiple whirlpools and small waterfalls, where you can soak and enjoy life. This area is a constant hit with our guests, and is enveloped by lush vegetation and canyon walls. It is a very relaxing place. Additionally, we have just completed refurbishing a hot springs pool. This hot spring is inside a gorgeous canyon, and is reached after a 20 minute walk. This spring, very popular decades ago, gave the ranch its name, Los Banos, meaning - the baths - or - the springs -. Could you tell us a little about the hiking? We have more than three dozen hikes, encompassing a wide range of diverse ecosystems and levels of difficulty. From mountain climbing in our higher elevations (up to 7,500 ft), to hikes along our mid-elevation hill country if you prefer wide open spaces, to our spectacular boxed canyon hiking through river beds, enveloped by 300-400 foot high canyon walls, our hiking offers virtually unlimited adventure. With our hikes designed for enjoyment, fun and adventure, and lasting anywhere from 2-6 hours, they are as diverse and as stimulating as anything out there. With so many hikes to choose from, you will never see the same trail twice. Hikes through our canyons, particularly El Cajon Canyon, Cajon de las Piedras, Cajon de la Catedral and Cajon Aguaje are very popular with our guests, each as different as the other. Whether hiking our upper elevation country or inside the Canyonlands, our hikes, all guided, will challenge, stimulate, excite and enliven you. They are all great adventures, full of thrills, challenges and fun. Could you tell us a little about bouldering/scrambling? Along with our canyon hikes are a good number of bouldering opportunities. Most of our canyons, and a few other locations inside the ranch, offer great bouldering adventures. Our bouldering adventures consist of climbing, canyoneering and otherwise trying to navigate through, over and below monstrous, car and truck size boulders, usually on the way to a cave or a breathtaking spot. For those interested in a full body workout, using a lot of upper body strength, not to mention the thrill of climbing canyons full of boulders, having your adrenaline pumping and looking at great scenery, our bouldering excursions, some in conjunction with our hiking adventures, are sure to leave you thrilled and satisfied. Could you tell us a little about the kayaking? Our kayaking, on both lake and river (though river kayaking is restricted based on water release schedule for the dam) is an opportunity for our guests to enjoy a break from riding or hiking or jeep tours, and relax in our water adventure settings. The lake, a 20 mile long pristine lake devoid of boats or people, offers intimate kayaking for hours of fun. Here, you can navigate into submerged canyons, kayak just offshore, or go deep into the middle of the lake. Our sturdy, top of the line kayaks are easy to maneuver and navigate. Could you tell us a little about the rides? I was wondering what a typical ride was like? Please refer to the bottom of our Horseback Riding page of the website for information. Any galloping or is it follow the leader? What about opportunities for cantering and trotting? As a beginner I do not have any riding boots. Are these essential or are alternatives available? Riding boots are not essential. We are very flexible with our riding policy. You can ride with hiking shoes or running shoes just as well. Does the ranch provide us with helmets? The ranch does not provide riding helmets as we are a "helmet-free" guest ranch. Guests interested in riding with helmets are invited to provide their own. As a learner, or beginner, you will be riding veteran, sturdy and noble horses, with a cowboy guide accompanying you at all times. While we have never had an incident or accident with our guests or horses, it is your call whether to bring a helmet or not. Could you tell us the true state of security in Mexico, Sonora and the region where the ranch is located? Please visit the page devoted to Security for more information. In short, insecurity is a non-issue, both in the region and the Rancho.